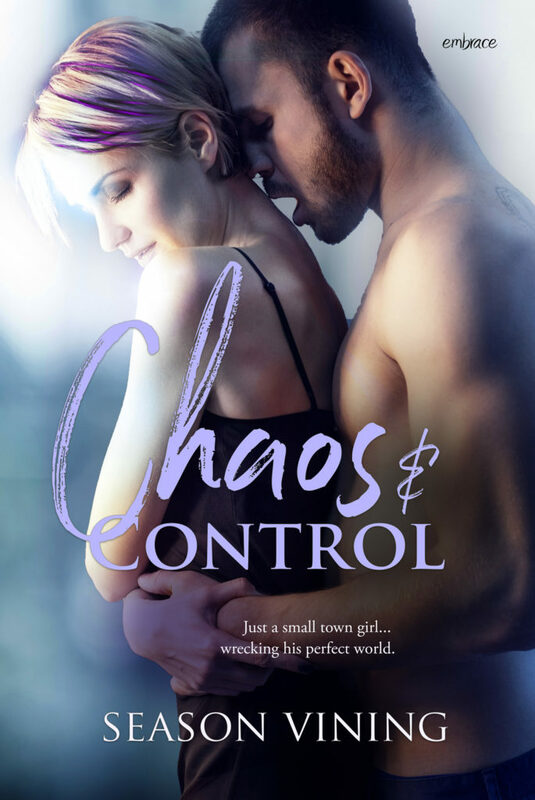 Coming December 11th, is CHAOS & CONTROL—a new contemporary standalone novel from Season Vining—a story about a woman (Wren) returning to her small Midwest town and finding a reason to stay in the mysterious and regimented Preston. Season’s romance was inspired by this viral video and I’m thrilled to give you a sneak peek below! “What are your plans today?” Bennie asks as I hop up onto Vinyl’s front counter. “I’d love to burn those boots,” she says. “Oh, you know. I had odd jobs here and there.” The lie escapes so easily it makes me sick. Preston passes by carrying a large box. I can see the muscles of his arms straining from the weight of it. In an unconscious decision, I hop down from the counter and follow him to the storage closet. Today he’s wearing a thin CBGB T-shirt and jeans that look soft and worn in. His boots look like mine, but clean. He straightens but doesn’t turn toward me. I stand there quietly waiting to be acknowledged. Preston faces a metal panel on the wall and touches the top left screw holding it in place. His index finger slides to the other top screw and then down to the bottom where he touches those two. He has no reaction to my presence except for the telltale stiff shoulders. I sit on a stack of empty crates and tap my heels against the floor. Preston turns, his eyes land on my feet and stay there. Preston folds his arms across his chest and leans against the wall opposite me. The curve of his biceps beneath that shirt makes me want to sink my teeth into his flesh. He looks so big and strong there, it seems as though he’s holding up the wall, not the other way around. “You’re staring,” he says. His words sound harsh, but the sugar-coated smirk he’s wearing tells me he’s teasing. I slide off the crates and walk toward him. There’s no look of panic, no visible instinct to flee. Instead, he watches me. His eyes stay on mine until I’m standing too close. My fingers curl and flex, wanting to touch him so badly. I fight that feeling, afraid of pushing him away. He exhales slowly as his hand reaches for me. I think, this is it. He’s going to pull me into his arms and kiss the hell out of me. Instead, he seems to inspect the buttons on my shirt. He touches the collar button and then each one gets a gentle poke, trailing his hand between my breasts and down to my stomach. Preston pulls a thread hanging loose and tucks it into his pocket. There seems to be a rather victorious smile on his face. “You had a thread,” he says simply. I look up at him through my lashes and wait. I don’t expect Preston to humor me, but people seem to be doing a lot of things I don’t expect these days.